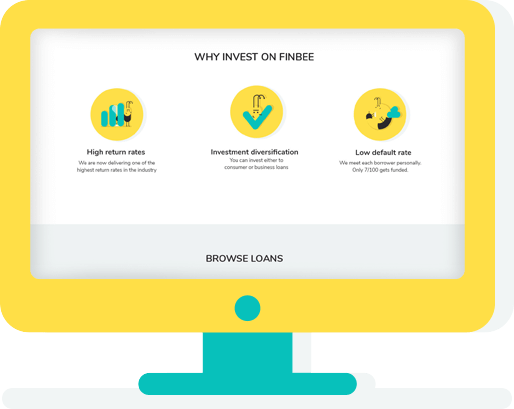 INVEST WITH FINBEE AND START EARNING TODAY! and NPLs rate of 4.8 percent is one of the best in Europe. As FinBee investor, you can invest to personal loans or business loans. We sign every loan contract with our borrowers in person. This adds an extra layer of security for your investment. Auction bids are sorted by date loan offer was added to the lending offers list. On the top are the newest offers. It will take you just a few moments to open your account. Transfer money you want to invest. Choose automated lending portfolio or invest manually. Investing has never been that easy! Each month you will get your monthly instalments. Cash out or reinvest your money. HOW TO MITAGETE INVESTMENT RISK OF BUSINESS LOANS? Experienced credit scoring specialists team at FinBee checks every single application and selects the very few best companies to invest to. Despite that, some of the companies might have difficulties to make payments and/or repay the loan what may lead the investors to losing part or all invested funds. We would like to mention that funds invested to the loans are not covered by deposit insurance provided by the Republic of Lithuania. Possible losses may be lowered by diversifying the investments, i.e. spreading your investments over a number of borrowers. Before investing to a specific business loan we strongly suggest to consider company’s financial results, activity sector, activity region, Head of the company, reviews of the service, offered pledges and also feel free to ask questions about the borrower.